Diamonds aren’t a girl’s only best friend! 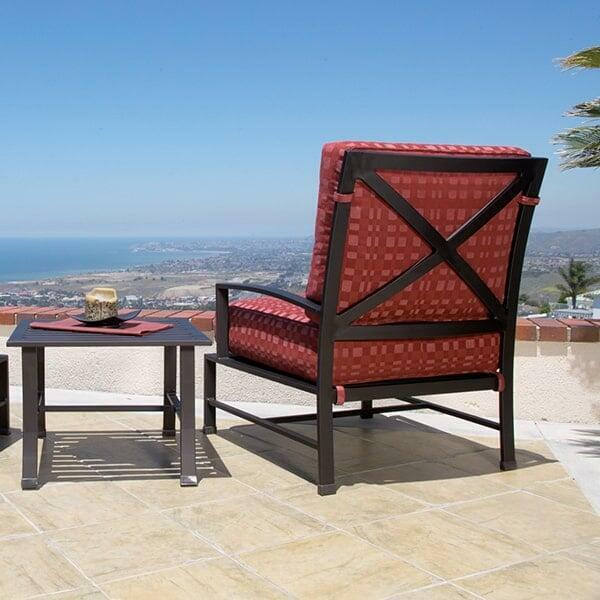 “La jolla” means “the jewel” and that is a fitting name for the La Jolla Deep Seating Collection by Sunset West. This gorgeous cushioned patio furniture set will bring a classic beauty to your outdoor living area. The La Jolla Deep Seating Collection features lavish cushioned seats with generously sized frames. The elegant X back design is finished with a rich chocolate powder-coating. No need to lock this jewel away; the La Jolla Deep Seating Collection is a weather-loving, fully welded, rust-free aluminum, which requires no special care or maintenance. The luxurious cushions are upholstered in Sunbrella brand fabric. Created specifically for outdoor use, Sunbrella is fade and water resistant and will maintain its appearance for years. The La Jolla Deep Seating Collection comes with your choice of brilliant cushion colors; Canvas Spa or Canvas Flax. Make your backyard look like a million bucks with the La Jolla Deep Seating Collection by Sunset West. Featured Set Includes: Sofa, 2 Club Chairs, Ottoman, Coffee Table, and End Table. 27"W x 33”D x 36H"